As Mandela Lies In Hospital, Family Fights Over Kin's Graves : The Two-Way A grandson moved the remains of three of Mandela's children. Other relatives sued. Now, a court has ordered that the remains be returned to their original burial site. And criminal charges have been prepared against the grandson. Former South African President Nelson Mandela remains in stable but critical condition at a Pretoria hospital, where he's been since June 8 for treatment of a serious lung infection. The anti-apartheid hero, who survived 27 years in jail and decades of oppression, is 15 days shy of his 95th birthday. 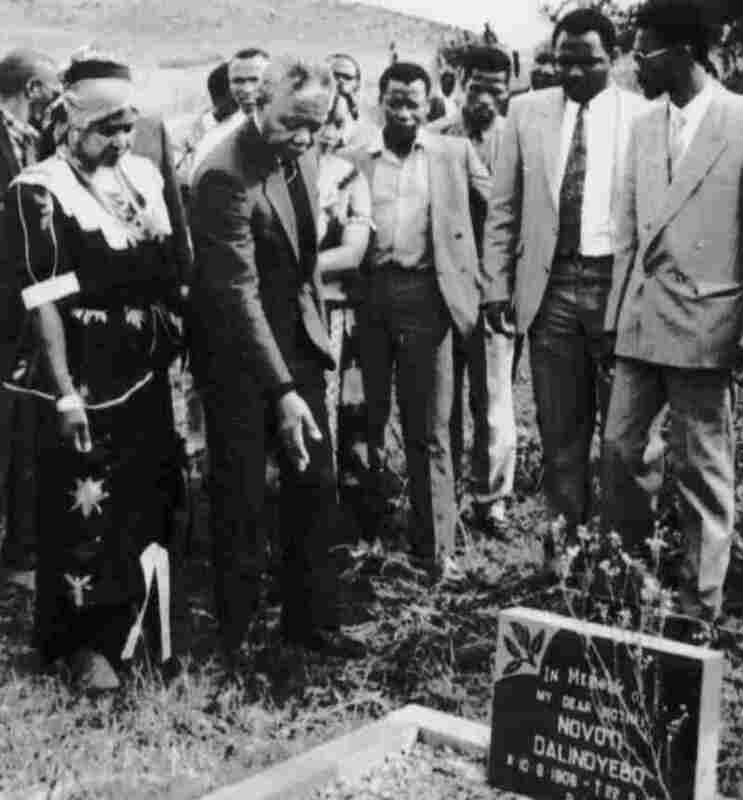 In 1990, Nelson Mandela (wearing a dark suit, pointing down) visited the graves of family members in Qunu, South Africa. A grandson's 2011 decision to move some relatives' remains to another site was followed by a lawsuit and court action. "A family feud over the burial site of three of Nelson Mandela's children intensified Tuesday when criminal charges were filed against one of his grandsons." According to the AP, Nelson Mandela "has long said that he wants to be buried in Qunu, where his children were buried in the family plot." A rival faction of Nelson Mandela relatives, led by his oldest surviving daughter, Makaziwe, went to court last week, to compel the remains of her late siblings to be returned to Mandela's ancestral home. They accuse his eldest grandson, Chief Mandla Mandela, the nominal head of the Mandela family, of exhuming the bodies two years ago and removing them to his village, Mvezo, 15 miles away, Quist-Arcton says. That's where he's building a heritage center dedicated to Nelson Mandela. The move infuriated his relatives, but on Wednesday a South African court ruled against Mandla and allowed the exhumation and reburial to take place. South Africa's News 24 says the remains are those of "Mandela's eldest son, Mandla Mandela's father, Makgatho Mandela, who died in 2005; Mandela's first daughter, Makaziwe Mandela, who died as an infant in 1948; and Mandela's second son, Madiba Thembekile, who died in a car accident in 1969." Television images and commentary show the court's representative using a pickaxe to force open the locks on the gates of Mandla Mandela's compound, opening the way for a convoy of police vehicles and Mandela family members. Police say the unmarked graves have been located and that exhumation of the remains has begun. Cultural commentator, Somadoda Fikeni says this unseemly family tug-of-war runs counter to custom and tradition. "It is believed that an elderly member of the family, or any member of the family, wouldn't have a smooth transition in their life to the afterlife if there was still some dispute or discord in the family," Fikeni says. Many South Africans were appalled by the very public family feuding, and the leader of Mandela's governing ANC party, Gwede Mantashe, said now should be a time of unity for the family. The BBC notes that Mandla Mandela was nominated by his grandfather to be "chief Zwelivelile of the Thembu people." Mandla Mandela is also a member of African National Congress Parliamentary Caucus. The Daily Dispatch newspaper quoted Ndaba Mandela as describing his half-brother, Mandla, as a "power hungry, self-obsessed man who is only concerned about himself." The Royal House of Nelson Mandela's Abathembu tribe and clan elders have offered to step in to try to resolve the family quarrel.